Four people have been injured one seriously so after a multiple vehicles collision on the N3 Durban Bound near Hammersdale offramp on Wednesday afternoon around 3pm. Rescue Care Paramedics arrived on the scene to find total chaos. 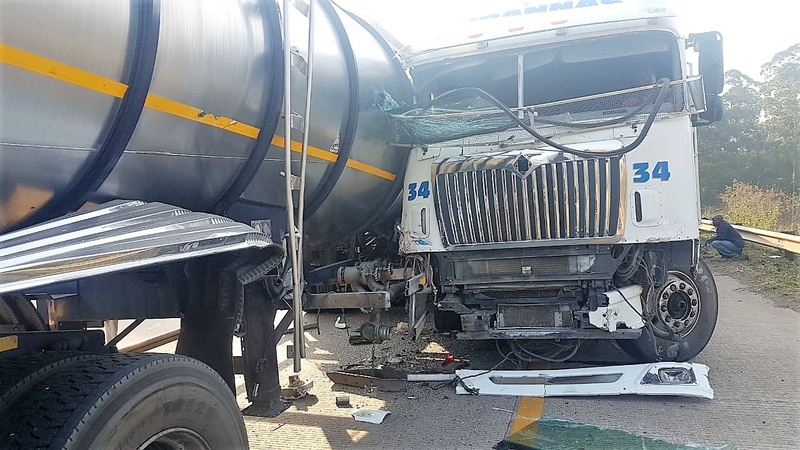 A truck had been on fire after the Hammersdale offramp and whilst the traffic started building up a secondary collision occurred involving Three Trucks and Two cars. The cars were severely damaged and in the one vehicle the driver was severely entrapped. The Durban Fire Department worked to cut the man free whilst Paramedics stabilised him inside the vehicle. The IPSS Black Eagle Helicopter was called in to assist with rapid transport of the injured man. After an hour the patient was finally freed and loaded into the helicopter where he was flown to a Durban Hospital. Three other people were treated on the scene for various injuries before being transported to hospital. The freeway was closed to traffic on the Durban Bound carriageway.